All are invited to attend our monthly Hospitality Sunday event after each service on the Temple lawn. We hope you can join us for some light refreshments, fellowship, and to meet some new spiritual friends. All are invited to attend our monthly Hospitality Sunday event after each service at 10:30 a.m. and 12:00 p.m.
Paramahansa Yogananda Birthday Commemorative Service - Monday, January 5th, 8:00 p.m.
SRF members and friends are invited to attend a Commemoration Ceremony honoring the birth of our Guru, Paramahansa Yogananda. The Ceremony will be on Monday, January 5th beginning at 8:00 p.m. in the Temple. For your convenience, flowers will be available on a donation basis, one hour before the service begins. After the service, all are invited to enjoy cake and chai in India Hall in honor of the anniversary of our Guru’s birth. 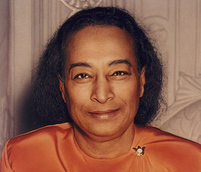 Paramahansa Yogananda Birthday Meditation - Saturday, January 10th, 10:00 a.m. - 4:00 p.m. Please join us on Saturday, January 12 for a special 6-hour meditation honoring the birth of our Guru, Paramahansa Yogananda. The meditation will be held in both India Hall and the temple. India Hall is for those who intend to stay for the entire day while the temple is open for those who can only attend for part of the day. The doors will open at 9:30 a.m. and the meditation begins promptly at 10:00 a.m., with a 30-minute break at 1:30 p.m. It is customary to bring a fruit as an offering. You may use meditation supports (armrests) in the patio area of the temple, but not in the main area of the temple or India Hall. We would also like to request that you not bring any food or water into either India Hall or the temple. Temple will be open for individual meditation at 5:30 – 7:30 p.m. Please join us on Saturday, January 10th for a special 6-hour meditation honoring the birth of our Guru, Paramahansa Yogananda. "Master's Return to India" Film - Sunday, January 11th, 12:00 p.m. Please join us for a special showing of the film “Master’s Return to India” on Sunday, January 11th at 12:00 noon in India Hall. This movie contains rare footage of our Guru taken during his trip to India in 1935-36. Valentine's Day Bake Sale - Sunday, February 15th, 10:30 a.m. - 1:30 p.m.
All are invited to our annual Valentine's Day Bake Sale on Sunday, February 15th from 10:30 a.m. to 1:30 p.m. in India Hall. There will be soup, salad, sandwiches, and tea in addition to a variety of delicious baked goods. The bake sale depends on your delicious baked goods for its success and we appreciate any and all baked goods you can donate. Please bring your baked goods to India Hall on Saturday, February 14th or before either service on Sunday, February 15th. 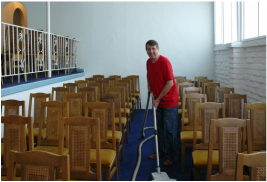 We hope you can join us after either service on Sunday, February 15th in India Hall! Please note that the Women's Hatha Yoga Saturday morning class will be cancelled on Saturday, February 14th in order to prepare for the Valentine's Day Bake Sale. Valentine's Day Bake Sale - Sunday, February 15th 10:30 a.m. - 1:30 p.m.
As the homeless and working poor of our community suffer from food and hunger issues throughout the year, not just around Thanksgiving and Christmas, we are expanding our food drive to help the Hope Again organization build up their food supplies to meet the needs of the coming spring and summer months when donations are typically low. You may drop off any non-perishable food items in the specially marked blue bins outside the Temple on Sundays and Thursdays after the services, until March 29th. We thank you for your generosity! In commemoration of the Mahasamadhi* of Paramahansa Yogananda, we will have a special Service in the Temple. All are welcome to attend. It is customary to bring a flower symbolizing devotion, and a free will monetary offering in an envelope as a symbol of loyalty and gratitude to the Guru and his teachings. Flowers will be available on a donation basis outside the Temple from 7:00 pm to 8:00 pm. 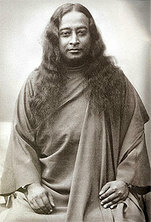 To learn more about our Guru, Paramahansa Yogananda, click here. * Mahasamadhi - The last meditation, or conscious communion with God, during which a perfected master merges himself in the cosmic Aum and casts off the physical body. A master invariably knows beforehand the time God has appointed for him to leave his bodily residence. All are invited to attend the special commemorative service that will be held in the Temple in honor of Paramahansa Yogananda's Mahasamadhi. In commemoration of the Mahasamadhi* of Swami Sri Yukteswar, we will have a special Service in the Temple. To learn more about our param-Guru, Swami Sri Yukteswar, visit SRF's main site here. All are invited to attend the special commemorative service that will be held in the Temple in honor of Swami Sri Yukteswar's Mahasamadhi. As the homeless and working poor of our community suffer from issues throughout the year, including lack of adequate food, we are helping the Hope Again organization to build up their supplies to meet the needs of the poor in the area. You may drop off imperishable food items in the specially marked blue bins outside the Temple until Sunday, March 29th. Thank you for your generosity! The Los Angeles Marathon is being held on Sunday, March 15th and street closures, especially if you are coming from the North of Hollywood Temple, may affect your drive to the Temple. You can find information on street closures from the Marathon website www.lamarathon.com. This silent retreat, meant for students of the SRF Lessons, will be especially beneficial for those new to the Lessons. 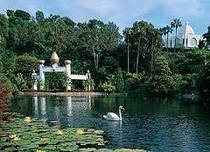 There will be a guided meditation with technique practice, a class, and time to enjoy the Lake Shrine gardens. Tentatively set for 10 am – 2:30 pm, on a free-will donation basis; and bring your own lunch. For more info, contact the Hollywood or Lake Shrine Temple office. For directions on how to get to Lake Shrine, visit their website at: www.lakeshrine.org. 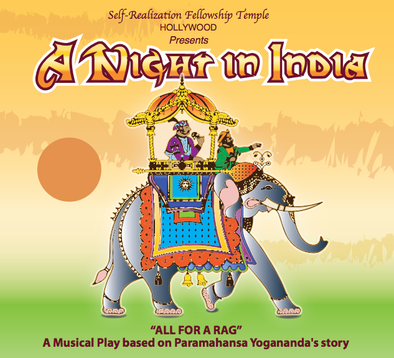 India Night, an annual event here at Hollywood Temple, is a musical play of one of Paramahansa Yogananda's stories from the SRF lessons. This year, our India Night presentation will have performances during the first two weekends of June. Auditions for the show will be held on Saturday, April 11th from 1-5 p.m. in Lower India Hall. If you have a talent for acting, singing or dancing and would like to audition, please sign up for a time slot outside the Temple at the specially marked table after both services on Sunday or after the Thursday evening service. We are also looking for people with any special performance skills like flexibility, juggling, magic tricks, etc. In addition, there are many opportunities to serve backstage in the technical aspects of the production. Please come to the specially marked table after the Sunday morning and Thursday evening Temple Services for more information, or call the Temple at (323) 661-8006 and ask to be connected with the Entertainment Coordinator. 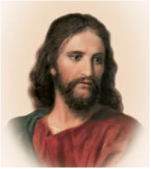 On Good Friday, the Temple is open for individual silent meditation and prayer from 12:00 noon to 7:00 p.m.
On Good Friday, the regular Friday night group meditation from 7:00 p.m. - 10:00 p.m. will be held in honor of Christ. The Temple will be open for individual meditation from 12:00 noon to 7:00 p.m. on Good Friday. Our regular conducted three-hour meditation will be in honor of Christ and will be held as usual from 7:00 p.m. - 10:00 p.m.
On Easter Sunday, our minister will give services at both 9:30 a.m. and 11:00 a.m. The service topic will be "The True Meaning of Resurrection." Morning meditation will be held from 8:30 a.m. - 9:15 a.m. and the evening meditation from 6:00 p.m. - 9:00 p.m. Morning Meditation will be held from 8:30 a.m. - 9:15 a.m. and Sunday Services will be held at 9:30 a.m. and 11:00 a.m. on Easter morning. On Wednesday, April 30th, there will be a three-hour group meditation from 7:00 p.m. to 10:00 p.m. in the Temple . For those unable to arrive by 7:00, the doors will reopen at 8:00 and 9:00 p.m.
3-hour Meditation - Wednesday, April 30th 7:00 p.m.
A 3-hour group meditation will be held on Wednesday, April 30th from 7:00 p.m. to 10:00 p.m.
Kriyaban Ceremony - Saturday May 2, 7:00 p.m.
Hollywood Temple will have one Kriyaban* ceremony this year on May 2 at 7:00 p.m. in the Temple. The ceremony is for Kriyabans who regularly attend Hollywood Temple. In order to make a reservation, please come in person to the Bookroom to register and pick up a reservation ticket; be prepared to show your Kriyaban card when you register. On the night of the ceremony, you must bring your Kriyaban card and the reservation ticket. Should you need a replacement Kriyaban card, please contact Membership Services at Mother Center. Also please bring a fruit, flower, and a monetary offering in an envelope. Flowers and fruit will not be available at the Temple on the night of the ceremony. Please note an important change from past Kriyaban ceremonies: devotees will not go to India Hall before the ceremony. Temple doors will open at 6:00 p.m. and we ask that all devotees please arrive between 6:00 and 6:45 p.m. so that you have enough time to make your offerings and be seated before the ceremony; Temple doors will close promptly at 7:00 p.m. There will be no individual meditation in the Temple from 5:30-7:30 p.m. on Saturday, May 2. 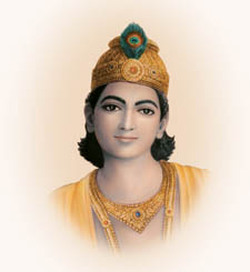 *A Kriyaban is one who has been initiated into the Kriya Yoga technique of meditation. To learn more about Kriya Yoga, visit SRF's main site here. Saturday, May 2, 7:00 p.m.
Hollywood Temple will have one Kriyaban ceremony in May. This ceremony is for Kriyabans who regularly attend Hollywood Temple. Please make a reservation in the Bookroom located in upper India Hall. Be prepared to show your Kriyaban card when you register. On Saturday May 9, SRF Kriyaban disciples are invited to join in an inspiring one-day retreat entitled "Deepening Our Relationship with God and Guru Through Kriya Yoga." The retreat will be led by SRF nuns and will be held at Lake Shrine Retreat from 8:30 a.m. - 5:30 p.m. Reservations are required as space is limited. Please call the Lake Shrine Retreat Office, at (310) 459-4740, for additional information. Rooms are currently available and we encourage those who are able to devote a weekend to their spiritual quest to stay at the Retreat in order to gain the most from this special program. One-Day Kriyaban Retreat at Lake Shrine - Saturday, May 9, 8:30 a.m. - 5:30 p.m.
On Saturday May 9, SRF Kriyaban disciples are invited to join in an inspiring one-day retreat entitled "Deepening Our Relationship with God and Guru Through Kriya Yoga." The retreat will be led by SRF nuns and will be held at Lake Shrine Retreat from 8:30 a.m. - 5:30 p.m. In commemoration of the birthday of our paramguru, Swami Sri Yukteswarji*, we will have a special Service in the Temple. All are welcome. It is customary to bring a flower symbolizing devotion, and a monetary offering in gratitude to the SRF line of Gurus and their teachings. Flowers will be available on a donation basis outside the temple from 7:00 p.m. to 8:00 p.m.
*The guru of Paramahansa Yogananda. 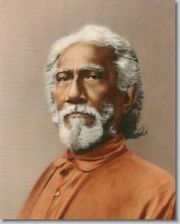 To read more about Swami Sri Yukteswar, visit SRF's main site here. Swami Sri Yukteswarji's Birthday Commemoration Service - Saturday, May 10th, 8:00 p.m.
All are invited to attend a special service in the Temple in commemoration of the birthday of our paramguru, Swami Sri Yukteswarji. 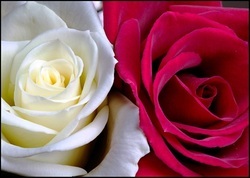 On Mother's Day, our minister will give services at both 9:30 a.m. and 11:00 a.m. The service topic will be "The Mother As an Expression of God’s Unconditional Love." We wish you a blessed Mother's Day! Our minister will give services at both 9:30 a.m. and 11:00 a.m. on the topic of "The Mother Aspect of God." We wish you a blessed Mother's Day! All are invited to attend our monthly Hospitality Sunday event after each Service at 10:30 a.m. and 12:00 p.m.
Temple Picnic - Sunday, May 25th, 11:00 a.m. - 4:00 p.m.
All are invited to the Temple picnic at the Old Zoo Picnic Area in Griffith Park. Join us any time, after either service. We will celebrate the day with fun, food and fellowship with wonderful people. Kindly bring your own packed lunch with a water bottle, and your own lawn chair or picnic blanket. For a map of Griffith Park and directions to the Old Zoo Picnic Area, click here. 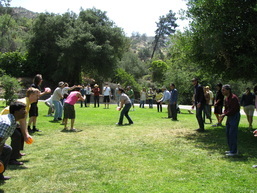 Temple Picnic - May 25th, 11:00 a.m. - 4:00 p.m.
All are invited to the Temple picnic at the Old Zoo Picnic Area in Griffith Park. Join us any time, after either service. We will celebrate the day with fun, food and divine fellowship! 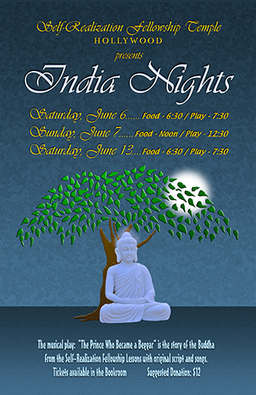 India Nights - Saturdays, June 6 & 13, at 7:30 p.m. and Sunday, June 7, at 12:30 p.m.
Hollywood Temple invites you to attend a performance of “India Nights," a theatrical presentation of Paramahansa Yogananda’s story “The Prince Who Became a Beggar”. It is the story of the Buddha from the Self Realization Fellowship Lessons and will be performed as a musical play with original script and songs. Read more on our Upcoming Events page. Hollywood Temple invites you to attend a performance of “India Nights” on Saturday evening June 13 at 7:30 p.m., and Sunday afternoon, June 14, at 12:30 p.m.
“India Nights” is a theatrical presentation of Paramahansa Yogananda’s story “The Prince Who Became a Beggar”. It is the story of the Buddha from the Self Realization Fellowship Lessons and will be performed as a musical play with original script and songs. Refreshments will be served outside before the show begins on both Saturdays beginning at 6:30 p.m., and on the Sunday matinee at 12:00 noon. Tickets are available in the Bookroom, and the suggested donation is $12. We hope you can join us for these very special performances! A Night in India - Saturdays June 7th & 14th at 7:00 p.m. and Sunday June 8th at 12:30 p.m.
Hollywood Temple invites you to attend a performance of " A NIght in India," to be presented on Saturdays June 7th and 14th at 7:30 p.m. with a Sunday matinee on June 8th at 12:30 p.m.
"A Night in India" is a musical play based on Paramahansa Yogananda’s story “All for a Rag." Light refreshments will be served outside before the show begins on Saturdays beginning at 6:30 p.m. and on the Sunday matinee at 12:00 p.m.
Tickets are available in the Bookroom. The suggested donation is $10. Our ministers will give services on Father's Day at 9:30 a.m. and 11:00 a.m. The service topic will be "The Father Aspect of God." We wish you a joyous Father's Day! "If you close your eyes and visualize vast, illimitable space, you become overwhelmed and enthralled - you feel naught but pure wisdom. That hidden, infinite sphere wherein there is no creation, no stars or planets - only pure wisdom - is the Father." Sunday, June 21, 2015, marks the first official UN-sponsored International Day of Yoga—an occasion for us to honor the ancient science of Kriya Yoga, which Paramahansa Yogananda introduced to the West almost a century ago. In support of this event, Hollywood Temple will be dedicating our regularly held Sunday evening meditation from 6:00 - 9:00 p.m. to the International Day of Yoga. Group practice of the Energization Exercise will precede the meditation on the Temple lawn at 5:40 p.m. 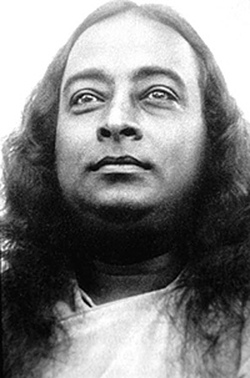 Many have commented how Paramahansa Yogananda played a unique role as the father of Yoga in the West. Special screenings of AWAKE: The Life of Yogananda have been announced, to celebrate the event, at three area Laemmle theatres - Pasadena, West LA, and Claremont 5: June 20-21. In addition, as part of the International Day of Yoga commemorative events, Self-Realization Fellowship and CounterPoint Films will be hosting a special screening of AWAKE: The Life of Yogananda on Saturday evening, June 20. There will be a brief introduction from the filmmakers followed by a kirtan and guided meditation led by SRF monks, and then the showing of the film. The event starts at 7:45 p.m. Doors will open at 7 p.m. Tickets are $15 and are available only online. This special event will be held at the Pico Union Project, a multi-faith house of worship currently home to five diverse faith communities. It is located a short distance from downtown Los Angeles. 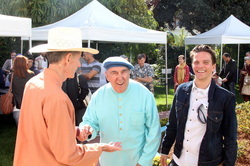 For more information please visit the film’s website www.awaketheyoganandamovie.com/dayofyoga. To read more about the International Day of Yoga, visit SRF's main site here. In support of this first ever U.N.-sponsored International Day of Yoga, Hollywood Temple will be dedicating our regularly held Sunday evening meditation from 6:00 - 9:00 p.m. to honor Paramahansa Yogananda as the Father of Yoga in the West. Girls' Youth & Teen Program: June 22 - 26, Mon. - Fri., 9:00 a.m. to 3:30 p.m. Boys' Youth & Teen Program: June 29 - July 3, Mon. - Fri., 9:00 a.m. to 3:30 p.m.
To learn more and register online, visit SRF's main website here. Hollywood Temple and grounds will be closed on Friday July 4th for the Independence Day holiday. The Temple will not be open from 5:30 - 7:30 p.m. for individual meditation and there will be no evening meditation service. We wish you a safe and happy 4th of July holiday! 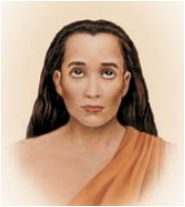 A special devotional service to honor Mahavatar Babaji will be held in the Temple on Saturday, July 25, at 8:00 p.m.
To learn more about Mahavatar Babaji, visit SRF's main site here. A special devotional Service to honor Mahavatar Babaji will be held on Friday July 25th at 8:00 p.m.
Come join us for our Annual Temple Cleaning Day in preparation for our visitors during Convocation and enjoy pizza, salad, and ice cream during the break at 12:30 p.m.
For more information, please call the Temple at (323) 661-8006. On Wednesday, July 30th, there will be a three-hour group meditation from 7:00 p.m. to 10:00 p.m. in the Temple . The annual SRF convocation will be held this year from Sunday August 3rd through Saturday August 9th. This week long event includes classes, group meditations and fellowship with SRF devotees from all over the world. Information about the convocation can be found on SRF's main site. The ticket will be available at Convocation, either at the Membership Services Desk in the Santa Anita Room or 45 minutes before the evening class outside the Pasadena Room. The annual SRF Convocation will be held this year from Sunday August 3rd through Saturday August 9th. This week long event, held in the Westin Bonaventure downtown Los Angeles, includes classes, group meditations and fellowship with SRF devotees from all over the world. SRF members and friends are invited to attend a Janmashtami Service honoring the anniversary of the birth of Bhagavan Sri Krishna on Sunday August 17th at 8:00 p.m. in the Temple. It is customary to bring a flower and a donation to be offered during the devotional service. As usual, for your convenience, flowers will be available on a donation basis one hour before the service begins. Please note that this Commemoration Service replaces our usual Sunday evening Meditation Service. A special devotional Service to honor the birth anniversary of Bhagavan Sri Krishna will be held in the Temple on Sunday, August 17th, at 8:00 p.m.
Everyone is invited to our Movie and Ice Cream Social, which will feature the film Glimpses of a Life Divine. We hope you can join us on Sunday, August 24th at 12:00 p.m. in India Hall for this special showing of this film, which contains interviews of Paramahansa Yogananda's direct disciples and others who knew Paramahansaji during his lifetime, as well as scenes of the Guru from various periods of his life. You will also be able to enjoy delicious ice cream deserts. This event is on a donation basis and all the proceeds will benefit Hollywood Temple Projects. Hollywood Temple and grounds will be closed on Monday September 1st for the Labor Day Holiday. The Temple will not be open from 5:30 p.m. – 7:30 p.m. for individual meditation. We wish you an enjoyable Labor Day holiday. Hollywood Temple’s Community Outreach Committee will again be conducting the “Care Package Project” to benefit and show caring toward our homeless neighbors. The Community Outreach Committee would like to thank everyone who has so generously donated items to the 2014 Care Package Project. We will continue to collect personal hygiene and small food items through Saturday, September 27th. Please place all items in the blue bins on Thursdays, or leave them at the table outside the Temple before or after Sunday services. You are also invited to join us in India Hall on Saturday, September 27th at 10:00 am to assemble the Packages. The Care Packages, which include the items donated by Temple members, along with a $5 gift card for food, will be available for distribution on Sunday, September 28th after each Sunday Service for a $5 donation which covers the cost of the meal card. All are invited to participate in a special Peace and Harmony weekend as we support the United Nations and contribute to the International Day of Peace, observed on September 21st. Friday, Sept. 19th - A conducted 3-hour evening meditation will be held in the Temple at 7:00 p.m., with the theme: “Changing Ourselves." Saturday, Sept. 20th - A conducted 3-hour meditation will be held in the Temple from 2:00 - 5:00 p.m., with the theme: “Forgiveness," followed by light refreshments on the Temple grounds. Sunday morning, Sept. 21st - Our 8:30 a.m. morning meditation and 9:30 a.m. Service will be cancelled. Sunday School will meet at 11:00 a.m. in the Lay Disciple Garden. The morning meditation will start at 10:00 a.m., followed by the Service at 11:00 a.m. After the Service, all are invited to join together for fellowship and an Indian lunch on the Temple grounds. The lunch is on a freewill donation basis. We look forward to sharing this special weekend with all! Please join us for this special weekend of conducted meditations and Temple fellowship in honor of the International Day of Peace, observed on September 21st. Friday, September 26th and Tuesday September 30th, 8:00 p.m.
"Through use of the Kriya key, persons who cannot bring themselves to believe in the divinity of any man will behold at last the full divinity of their own selves." 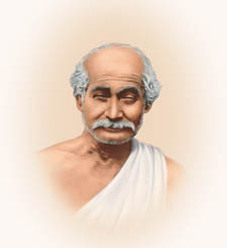 On Friday, September 26th, a devotional service commemorating Lahiri Mahasaya's mahasamadhi will be held in the Temple at 8:00 p.m.
On Tuesday, September 30th, a devotional service commemorating Lahiri Mahasaya's birthday will be held in the Temple at 8:00 p.m. It is customary to bring a flower symbolizing devotion, and a monetary offering in gratitude to the SRF line of Gurus and their teachings. Flowers will be available on a donation basis outside the Temple before each service from 7:00 p.m. to 8:00 p.m.
*To learn more about our param-param Guru, Lahiri Mahasaya, visit SRF's main site here. Friday, Sept. 26th & Tuesday, Sept. 30th, 8:00 p.m.
All are welcome to attend the special services that will be held to honor Lahiri Mahasaya's mahasamadhi and birthday. Hollywood Temple invites all to attend a special showing of the movie The Making of the Mahatma on Saturday September 27th from 2:00 - 4:30 p.m. in India Hall. Mohandas Gandhi, a young England-educated barrister at-law, then practicing in Rajkot, India, is invited by an Indian firm in South Africa to handle their law suit. "The Making of the Mahatma" is about M.K. Gandhi's early story of experiments with truth, which gave to mankind a new weapon to fight for freedom from all kinds of oppression, and about the process of transformation from Gandhi, the man, to Gandhi, the Mahatma. We hope you can join us on Saturday afternoon September 27th from 2:00- 4:30 p.m. for this inspiring movie. Saturday, September 27th, 2:00 - 4:30 p.m.
We invite all to attend a special showing of the movie “The Making of the Mahatma” on Saturday September 27th from 2:00 - 4:30 p.m. in India Hall. All are welcome attend our Movie Night on Saturday October 11th at 6:30 p.m. featuring the film of Sri Daya Mata’s first trip to India entitled In Master’s Footsteps. This inspiring film chronicles Sri Daya Mata's trip to India in 1958-1959. Doors open at 6:30 p.m. and light refreshments will be served. The film will play from 7:00 - 9:00 p.m. in India Hall. This event is on a donation basis and benefits the Hollywood Temple Projects. 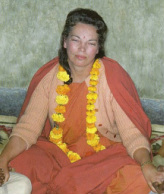 To learn more about Sri Daya Mata, the beloved Sangha Mata and President of SRF from 1955-2010, visit SRF's main website here. Movie Night - Saturday October 11th, 6:30 p.m.
All are welcome attend our Movie Night on Saturday October 11th at 6:30 p.m. featuring the film of Sri Daya Mata’s first trip to India entitled In Master’s Footsteps. 3-hour Meditation - Wednesday, October 29th 7:00 - 10:00 p.m.
We welcome you to join us for a 3-hour group meditation that will be held in the Temple on Wednesday, October 29th from 7:00 p.m. to 10:00 p.m.
All are invited to participate in the spirit of giving by bringing to the Temple non-perishable food items for our annual Thanksgiving Food Drive. Long Meditation - Wednesday, October 29th, 7:00 -10:00 p.m.
On Wednesday, October 29th, there will be a three-hour group meditation in the Temple from 7:00 p.m. to 10:00 p.m.
For those unable to arrive by 7:00 p.m., the doors will open again during periods of chanting at 8:00 p.m. and 9:00 p.m. If you have not already done so, please review our Guidelines for Group Meditation. On Saturday, November 8th, all Spanish speaking SRF lessons students and Kriyaban disciples are invited to join in an inspiring one-day Retreat in Spanish. The retreat will be led by Spanish-speaking nuns from the Mother Center and will be held at our Lake Shrine Retreat. The classes, meditations and chanting will be conducted in Spanish. Reservations are required and are being accepted at the Lake Shrine Retreat Office. 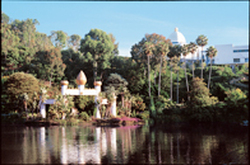 Please contact the Lake Shrine Retreat Office by phone: (310) 459-4740, or by email: lsreservations@yogananda-srf.org. On Saturday, November 8th, all Spanish-speaking SRF Lessons students and Kriyaban disciples are invited to join in an inspiring one-day Retreat in Spanish at the SRF Lake Shrine. Christmas Festival Auditions - Sunday, November 9th, 12:00 p.m. The annual Christmas Festival will take place this year on Sunday, December 7th. Those of you who sing or play a musical instrument are invited to audition for our Christmas-themed entertainment; the audition will be on Sunday, November 9th at 12:00 p.m. in Lower India Hall. Please provide your own accompaniment – a piano and CD player will be available. If you cannot make the audition, but would like to participate, please call Hollywood Temple and ask for the Christmas Festival Entertainment Coordinators. We will also need technical and backstage help. If you would like to serve in this capacity, please come to the audition or call the Temple and ask for the Christmas Festival Entertainment Coordinators. We look forward to hearing you on Sunday, November 9th at 12:00 p.m.
Those of you who sing or play a musical instrument are invited to audition for our Christmas Festival entertainment; the audition will be on Sunday, November 9th at 12:00 p.m. in Lower India Hall. Thanksgiving Morning Meditation - Thursday, November 27th, 9:00 a.m. - 11:00 a.m.
We will have a special 2-hour meditation on Thanksgiving morning, Thursday, November 27th between 9:00 a.m. and 11:00 a.m. After the meditation Hollywood Temple and grounds will be closed for the rest of the day. There will be no Thursday evening service and the Temple will not be open for individual meditation from 5:30 – 7:30 p.m. The Bookroom will not be open on Thursday or Friday and will reopen Saturday morning at 10:00 a.m. The Temple and grounds will reopen for individual meditation on Friday at 5:30 p.m., as well as the Evening Meditation Service. We wish you blessed Thanksgiving holiday. Please help us provide cozy, comforting pajamas, robes and slippers to children who are ill and receiving medical treatment at our local hospital this Christmas season. Wednesday 3-hour Meditations in December - Dec. 3rd, 10th and 17th, 7:00 p.m.- 10:00 p.m.
On the Wednesdays in December leading up to the all-day Christmas meditation (Wednesdays, December 3rd, 10th and 17th) there will be three-hour group meditations from 7:00 p.m. to 10:00 p.m. in the Temple. For those unable to arrive by 7:00 p.m., the doors will reopen at 8:00 and 9:00 p.m.
3-hour Meditation - Wednesday, Dec. 17th, 7:00 p.m.
A 3-hour group meditation will be held on Wednesday, December 17th from 7:00 p.m. to 10:00 p.m.
All are invited to enjoy the Christmas festivities after both services on Sunday, December 7th in India Hall. A delicious lunch will be served, as well as a bake sale and holiday entertainment, all in a festive café atmosphere. To ensure the success of out Christmas bake sale, we would appreciate your cakes, cookies, puddings, quiches, muffins, pies, scones, cupcakes and any other creative culinary dish you can imagine! Please bring your baked goods to India Hall on Saturday, December 6th or before either service on December 7th. We are still in need of volunteers to serve food, baked goods, and help clean up for this event. Please contact the receptionist if you are available to help. We look forward to enjoying some Christmas cheer together on December 7th! All are invited to enjoy the Christmas festivities following both services on Sunday, December 7th. A delicious lunch, bake sale and holiday entertainment will be held in India Hall's festive cafe atmosphere. 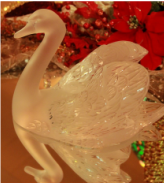 Self Realization Fellowship warmly invites you, your family, and friends to a Christmas Open House at the Mother Center on either Saturday, December 13th from 1:00 - 5:00 p.m. or on Sunday, December 14th, from 1:00 - 5:00 p.m. The open house provides an opportunity to meet informally with the monastics and each other in the spirit of Christmas fellowship. Light refreshments will be served. We look forward to greeting you all at this event! "We want to let everyone know about a last-minute change regarding the Christmas Open House scheduled for the weekend of December 12-14. In the process of obtaining our permits for this public gathering, unexpectedly an issue arose that will prevent our using the International Headquarters building for this event. We regret that the building, including Paramahansa Yogananda’s shrine rooms on the third floor, will be closed during the Open House. Because the main chapel will be not be available, an outdoor meditation area will be set up in the fish pond area for individual meditation, and periods of kirtan will be added to the program. Please keep in mind that all the activities will take place outside on the grounds and dress appropriately for the weather on those days. "Because all the activities are outdoors, Open House will not be held on Friday night as in past years. HollywoodTemple devotees are welcome to come Saturday or Sunday from 1:00 to 5:00 p.m."
Due to the cancelation of the Friday evening Open House, Hollywood Temple will have a minister-led 3-hour meditation in the Temple from 7:00 -10:00 p.m. on Friday, December 12th; this will be preceded by a group practice of Energization Exercises at 6:40 p.m. as usual. Self Realization Fellowship warmly invites you, your family, and friends to a Christmas Open House at the Mother Center to meet informally with the monastics and each other in the spirit of Christmas fellowship. Hollywood Temple devotees and friends are welcome to attend the Open House on either Saturday, Dec. 13th, or Sunday, Dec. 14th, from 1:00 to 5:00 p.m.
* Please see our Upcoming Events page for a special announcement from Mother Center regarding an important change in the Christmas Open House event. All Day Christmas Meditation - Saturday, December 20th, 10:00 a.m. - 5:00 p.m.
A spiritual highlight of the year for members and friends of Self-Realization Fellowship is the tradition of devoting a whole day to meditation and communion with Christ during the Christmas season. This practice was started by Paramahansa Yogananda in 1931 and continues to this day in SRF temples and centers worldwide. Paramahansaji often predicted this practice would spread throughout the world as more and more people come to realize the true meaning of the celebration of the birth of Christ. All are welcome to join us for our annual all day Christmas meditation to be held this year on Saturday, December 20th. The meditation will be held in both India Hall and the Temple. India Hall is for those who intend to stay for the entire day while the temple is open for those who can only attend for part of the day. The doors will open at 9:30 a.m. and the meditation begins at 10:00 a.m. There is a 30-minute break at 1:30 p.m. and the meditation will conclude about 5:00 p.m.
As is customary, you may bring a fruit and a monetary gift in an envelope as an offering. You may use meditation supports (armrests) in the patio area of the Temple, but not in the main area of the Temple or India Hall. We would also like to request that you not bring any food or water into either India hall or the Temple. You may wish to review our Group Meditation Guidelines. We hope you can join us for this blessed custom of setting aside one day each year solely to commune with God. Please note that the Temple will not be open for individual meditation from 5:30 p.m. - 7:30 p.m. after our all day Christmas meditation on Saturday December 20th. All Day Christmas Meditation - Saturday, Dec. 20th, 10:00 a.m. - 5:00 p.m.
A spiritual highlight of the year for members and friends of Self-Realization Fellowship is the tradition of devoting a whole day to meditation and communion with Christ during the Christmas season. All are welcome to join us for our annual all day Christmas meditation to be held this year on Saturday, December 20th. Christmas Morning Meditation - December 25th, 9:00 a.m. - 11:00 a.m.
We invite you to join our traditional Christmas Morning Meditation from 9:00 a.m. to 11:00 a.m. in the Temple. On Christmas Eve, Wednesday December 24, the Bookroom will close early at 1:00 p.m. and the Temple will not be open for individual meditation in the evening. Also, after the Christmas morning meditation Hollywood Temple and grounds will be closed for the rest of the day and will not be open for individual meditation from 5:30 – 7:30 p.m. or the Thursday Evening Service. The Temple and grounds will reopen on Friday, December 26th at 5:30 p.m. for individual meditation, followed by the Friday 3-hour Meditation Service at 7:00 p.m. We wish you a most joyous Christmas. Christmas Morning Meditation - Thursday, Dec. 25th, 9:00 a.m. - 11:00 a.m.
New Year's Eve Meditation - Wednesday, December 31st, 7:00 p.m. - 12:15 a.m.
Our annual New Year’s Eve Meditation will be held on Wednesday, December 31st from 7:00 p.m. to 12:15 a.m. in the Temple. For those unable to arrive by 7:00 p.m., you will be able to join the meditation during periods of chanting. To read the 2015 New Year's Message from the president of Self-Realization Fellowship, Sri Mrinalini Mata, visit SRF's main site here. New Year's Eve Meditation - Wednesday, Dec. 31st, 7:00 p.m. - 12:15 a.m.
Our annual New Year’s Eve Meditation will be held on Wednesday, December 31st from 7:00 p.m. to 12:15 a.m. in the Temple. A memorial service for Therese Johnson will be held on Saturday, July 12th at 2:00 p.m. in the Temple, with a reception following. Therese was a long time SRF devotee and served for many years. In fact, some of you may have seen her carrying trays of food and drinks to the Temple lawn for our recent “A Night in India” Sunday matinee. She passed peacefully on Monday night, June 9th. We hope you can make the Memorial Service on Saturday July 12th at 2:00 p.m. in the Temple. Memorial Service for Faith Levy - Sat., Dec. 6th, 2:00 p.m. Please join us for a memorial service for Faith Levy on Saturday December 6th at 2:00 p.m. Faith was a long time SRF devotee and Hollywood Temple Lay Disciple group member. We hope to see you there.